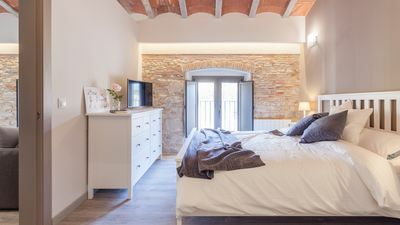 As you meander through the country lanes through the old town of Pollensa in the direction of Alcudia, you pass many lovely villas and gracious houses, but at the end of one such lane you arrive at the absolutely stunning Villathis property. This luxury Majorca villa would not look out of place in any glossy magazine and is simply the most extravagant villa in our Pollensa programme. 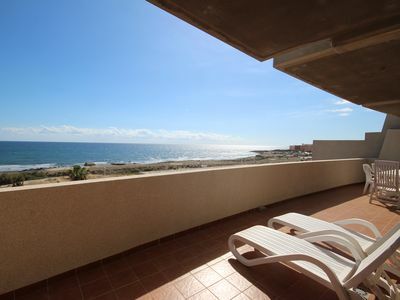 Facing south and set in some two acres of land it catches the sun all day through and overlooks glorious open countryside towards Palma road and the hills of Alcudia in the far distance. 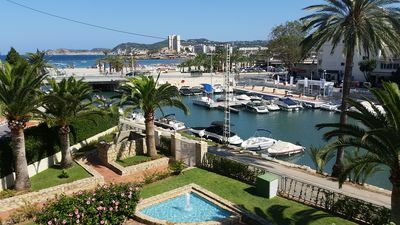 The private drive leads down to an extensive parking area and the double fronted entrance leads into the spacious hall of this Pollensa Bay villa. You cannot help but be impressed by the tiling, wood and stonework, soft furnishings and attention to detail that this young professional owner has achieved in his property. 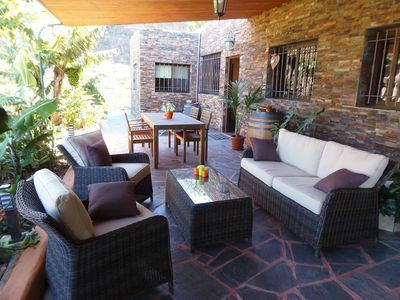 The traditional Mallorcan pebble stone entrance hall then leads into the enormous air-conditioned lounge/dining room. 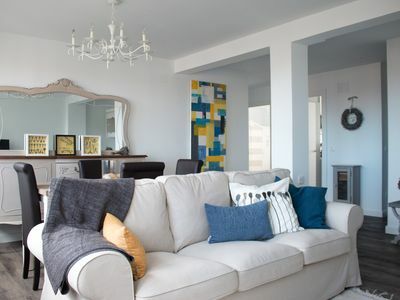 The most comfortably furnished lounge area has large sofas, feature glass fronted fireplace, flat screen TV with News and International channels, DVD and music centre. The formal dining area has seating for 10 and two sets of patio doors lead onto the front covered terrace, which again has large dining table for 8. 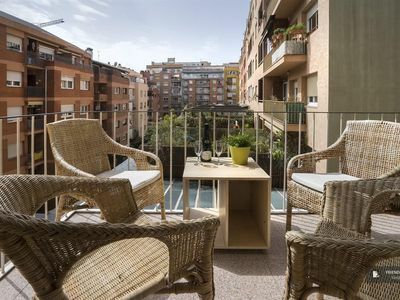 At one end of this covered terrace is a most prestigious barbeque kitchen for those meals al-fresco. The kitchen is simply 'to die for' and this leads off from the dining area, as well as patio doors opening out onto the barbeque kitchen. 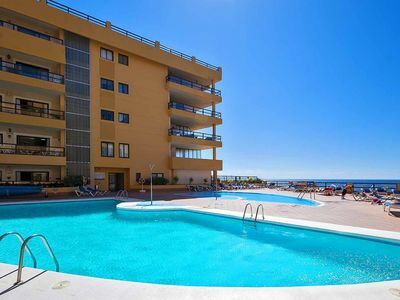 very spacious indeed and fully fitted with the most modern units, sophisticated lighting and offers the most up-to-date appliances including ceramic hob/oven, dishwasher, microwave and grill. There is a breakfast area and adjacent to this is a larder with deep freeze and laundry area with washing machine. On this ground floor level also is a small study, which has a bed settee for an extra child or nanny. The first of the master bedroom suites is situated on this ground floor level. 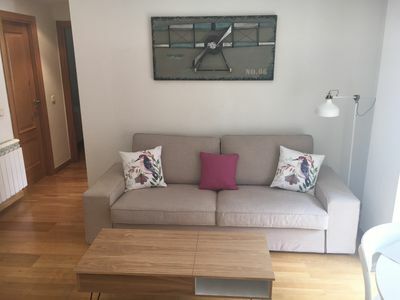 This is a glorious double bedroom furnished in matching oak and adjacent to this is a most wonderful family bathroom with large bath, separate shower cubicle, WC and vanity unit. A marble stainless steel staircase then leads to the first floor and the further four bedrooms. 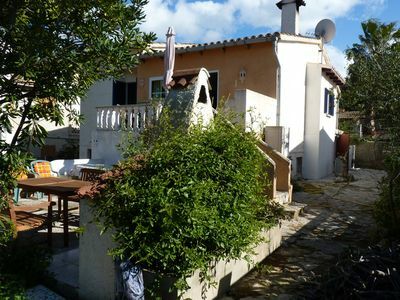 There are two pretty twins, which face the front of the villa and each of these has patio doors onto the front upstairs terrace, whilst at the end of the landing is the third twin room and this has patio doors onto a separate side terrace. 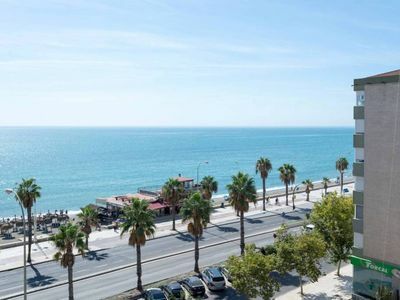 The truly wonderful family bathroom with double vanity unit, bidet, bath and separate walk-in shower is located adjacent to these bedrooms and boasts the most modern of fittings. Finally at the end of the landing a gracious master double bedroom suite is again fitted in oak and has a dressing area and large patio doors onto the front terrace and pool area. This enjoys a most modern en-suite shower room with double shower cubicle, WC and vanity unit. 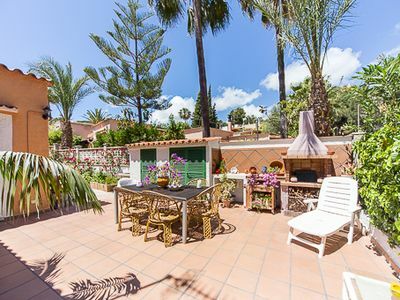 Outside the enormous covered terrace stretches the full width of this Majorca family villa and a few steps lead down to the spacious, well furnished sun terraces and lawned gardens. Taking pride of place in the centre of these is the 12 metre freeform pool, which has gentle steps into a shallow end for children. 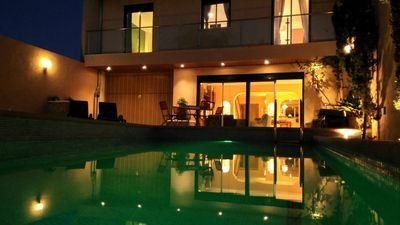 The pool has soft green tiles so as to blend in with the natural landscape and the whole area is illuminated at night creating a wonderful atmosphere in which to enjoy those balmy evenings. 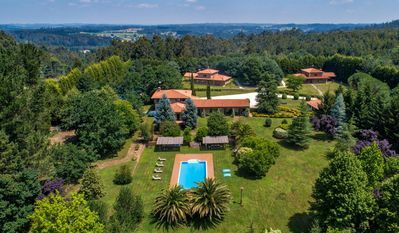 In fact this villa is exactly what you would expect from a villa that if it went onto the open market for sale would be worth around €3m. 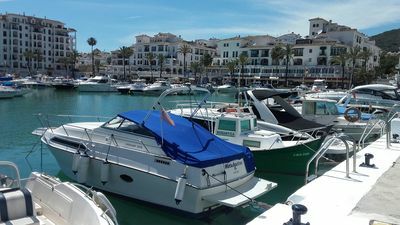 If you want to explore further afield from the villa then why not try some excellent sailing or cycling in Majorca; both come highly recommended. Mallorca is also famous for its bird watching and walking and in 2010 the Serra de Tramuntana was awarded UNESCO World Heritage status, Cultural Landscape. The wine and gastronomy really has to be tried and appreciated. There is so much to do in Pollensa and Mallorca generally. Just ask our sales specialists or your 24 hour support team in resort. Either will be happy to advise on and book whatever you wish to do. 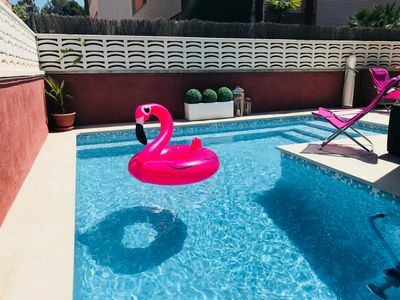 This property is fantastically located for anyone looking for a luxury holiday in a villa with private pool in Puerto Pollensa. 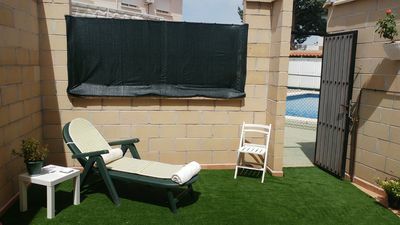 This villa, in es Barcarès, is a comfortable property sleeping 11 people. 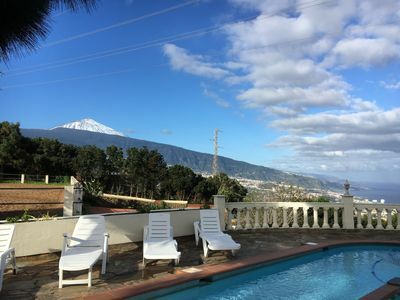 The villa offers superb accommodation, including modern luxuries such as a swimming pool, television, covered terrace, open terrace, air conditioning, DVD player, table tennis and internet access. 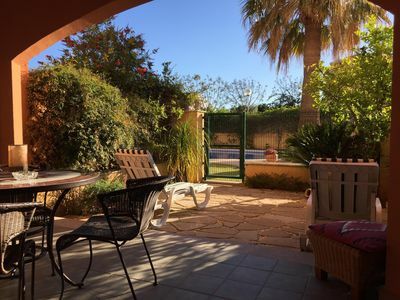 You can bask under the Spanish sun in the villa’s beautiful covered terrace, garden and open terrace, making use of its barbecue and barbecue. 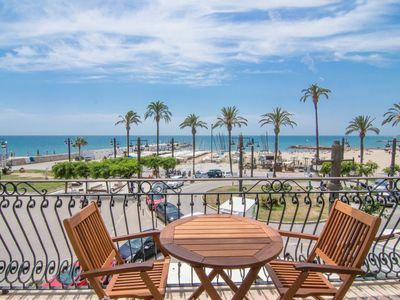 RIBERA PETIT Small apartment with superb sea views in Sitges.